Among my many dancer friends, Mamata Niyogi-Nakra, has devoted detailed and meticulous attention to dance training for children. She has put her thoughts in a book form with illustrations and she takes the reader gently into her creative journey, in reader friendly text. The book Shishu Sadhana and the DVD accompanying it has been a result of more than a quarter of a century’s involvement with teaching Bharata Natya in Montreal. Trained by Prof. US Krishna Rao and UK Chandrabhaga Devi, disciples of legendary Pandanallur Meenakshisundaram Pillai, Mamata’s performing career as a solo dancer in India, came to an abrupt end on account of an injury to her arm. 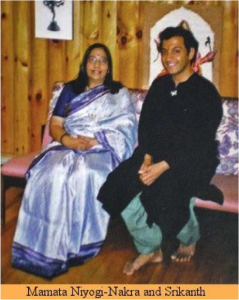 However, when she moved to Montreal, she started teaching Bharata Natya at her institution Kala Bharati. She developed a unique method of training her students and transmitted the Pandanallur ‘bani’ to the young students of Indian Diaspora in a remarkable way. 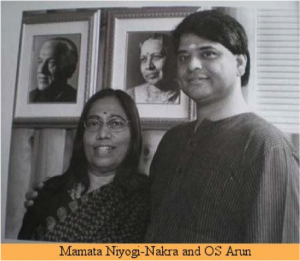 I shall write about Kala Bharati (http://kalabharati.ca) and several other aesthetic encounters with Mamata and her husband Dr. Harbans Nakra in a separate article. But back to the book Shishu Sadhana and the accompanying DVD. She used the available Paras raga tillana music and choreographed a number which in Kala Bharati parlance is called as the ‘animal tillana’ and was extremely popular with children. The children enjoyed executing the movements of the peacock, the elephant, the crocodile, the deer, the snake etc. Mamata realized that the learning was easier and faster when children were enjoying the movements and could relate to them and that the animal movements come naturally to children. Further reading of anthropological studies led her to believe that dance movements have evolved from animal movements: jump, leap, glide, roll, run, and stamp in dance. It was further confirmed when she met Seraikella Chhau exponent Shashadhar Acharya, who demonstrated the various ‘Uflis’ and ‘Topakas’ inspired from the movements of animals. Mamata created a pada called ‘The Doll Story’ in which relationship between a child and her doll is exploited to highlight the experiencing of the nine emotions, Navarasa, at a level that the child can comprehend. Mamata ran Kala Bharati centre where she trained a number of students and succeeded in forming a professional troupe of dancers. When the troupe with Mamata and Dr Nakra visited India, they won the hearts of Indians, who were pleasantly surprised seeing the very high standard of training Mamata had imparted to the young disciples, far removed from India. When I saw their dance, I wrote enthusiastically that perhaps the excellent level of Bharata Natya will be found not in India but in Montreal. Other critics also echoed my impressions. As observed earlier, despite an injury to her arm, even when she had given up dancing, she evolved a methodology of training dancers that established Kala Bharati’s reputation and hers as a brilliant choreographer. I remember Mamata showing those writings and notes during my visits to Montreal. Her assiduous work has resulted in this rare repertoire, which if followed by various schools and teachers interested in training children in dance, would benefit them immensely. Mamata’s participation in the activities of the international organization Dance and the Child International (daCi) in London in 1988 opened up for her a new perspective in training children. Further participation in the daCi European Summer Camp in the Netherlands in 1996 and the Regina (Canada) conference (daCi 2000) widened the horizons in the field of teaching dance to children. Her husband Dr. Harbans Nakra’s support was total and his paper ‘The Place of Dance in Basic Education’ enhances the need for such training. The response the couple received from dance teachers and educators from all over the world made Mamata create this repertoire which has many distinct features. The detailed notes, sketches, quotations from children’s writings, the discussions with teachers, students, scholars, musicians, the selection of songs for the repertoire in different Indian languages for numbers like shabda, varna, pada and also special music compositions of Alarippu, Jatiswara, Tillana, Aradhana, all have been meticulously worked out with great patience and considerable thought. The item also becomes participatory when the dancer invites others from the audience to join them on stage. Mamata has also chosen folk Bengali tune as an introduction to rich heritage of folk music. I find this piece very interesting and it explains Mamata’s approach to child friendly repertoire clearly. Another interesting pada is ‘Meri Chitthi’ (Letter to Lord Nataraja). The posing of questions, thereby discovering attributes of Lord Shiva, and what is interesting is that it draws attention to dancer dancing non-dance movements. Mamata notes that she saw ‘Cinq Pas Deux’ choreographed by William Forsythe. Watching two dancers get into a mode of non-dance in the middle of one of the pas de deux, momentarily stopping to figure out their next steps as if in a rehearsal, reminded her of her own use of this element in ‘Meri Chitthi,’ and how it had brought out an added dimension in their creations. I agree with her. How wonderful to be working with different styles of dance, Ballet in Forsythe’s case and Bharata Natya in Mamata’s. And it is interesting how creative choreographers think alike! I have given only two examples of the imaginative range of the repertoire. The video recording of the entire repertoire was done in September 2004, when Chennai based Bharata Natya dancer Srikanth, after summer residency at Kala Bharati in Montreal, had learnt all the refined choreographies from Mamata. The three months of hard work of mastering all items has shown excellent result in his dancing. I also enjoyed seeing the photographs of the documentation of video recording. The inter-active sessions with disciples of Mamata throw light on the subtleties of various items. For teachers who would like to adopt this repertoire for their individual chosen classical dance form like Kathak, Odissi, this interaction would show how disciples learn to notice the various details of the items choreographed. The book is designed well. It has a cover painting by Premola Ghosh of India International Centre, New Delhi; sketches by Sampa Ghosh, Ti-Kwew, and detailed acknowledgement of each department is given at the end in Credits section. I strongly recommend all interested in training children in dance to posses a copy of the book, DVD and CD of music. The exercise which has been primarily done by Mamata, on the form of Bharata Natya can be extended to other classical dance forms on similar lines. 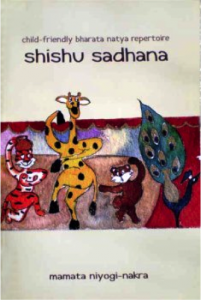 Shishu Sadhana is a pioneering effort in that direction and it will be a boon for all children who love dance.